Linecross Composites, which can count household names such as Bentley, Aston Martin and JCB amongst its customer base, is flying the flag for the region, building on its reputation for innovation and challenging traditional methods of manufacturing vacuum-formed thermoplastic, polyurethane and injection moulded components. Formed in 2012 when parent company Linecross Ltd bought its competitor BI Composites out of administration, the firm provides clients in the automotive, leisure and speciality industries with a full design and manufacturing service – from initial design to ‘just in time’ supply direct to trackside from its site on Green Lane in Bridgtown. As the business has expanded, so has its reputation for its commitment to technical innovation. As a result, it is now one of the industry’s leading manufacturers of engineered plastics and polyurethane components. Its diverse client base includes luxury car makers Bentley and Aston Martin, JCB, London Taxis and caravan manufacturers Swift Group and Coachman – all leaders in their respective fields. Over the past 12 months the company has invested more than £3.1m at its two sites in Cannock and Rutland. 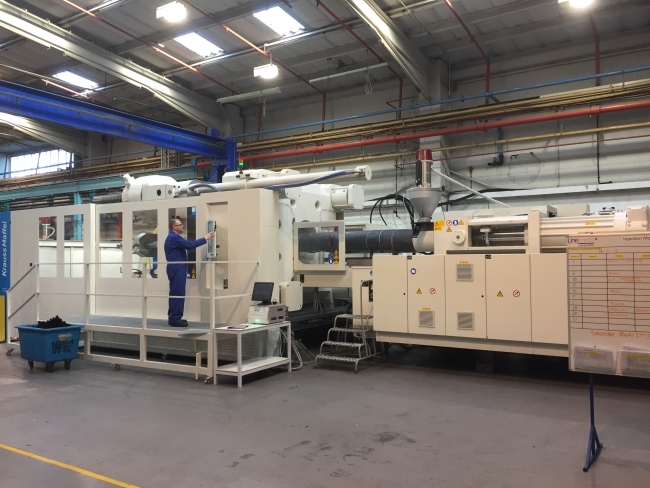 A significant investment has been made in three vacuum forming machines, including twin sheet forming capabilities, with further equipment including two new injection moulding machines with clamp forces of 2300 and 900 tonnes, providing the ability to mould large automotive interior parts. Efficiency and productivity improvements have also been aided with new robotic handling systems and an ultrasonic welding robot to support assembly operations. Over the years, Linecross has established a reputation across the industry for its commitment to innovation. One of Linecross’ most high-profile collaborations to date is with the world-famous Antler Suitcases. The company has developed a method to process new material, Armordon – a self-reinforcing polypropylene fabric, which exhibits exceptionally high impact strength, combined with low density – into a super light, super tough new suitcase called Atom. David continues: “We have been at the forefront of advancements in the industry for 50 years and have established a culture of collaborative partnerships with our customers and other industry specialists, which has enabled us to support many iconic, global brands. Founded in 1967, the Linecross Group, which comprises Linecross Ltd and Linecross Composites, has grown from a microbusiness with just two employees, to one of the industry’s leading manufacturers of engineered plastics and polyurethane components. The company employs more than 300 staff across its two facilities in Rutland and Cannock. Group turnover topped the £27m in the last financial year and is expected to exceed £30m during the current financial year.